Generally, there are two types of Mona hijab. They varies depending on the way the underscarf is sewn together with the scarf . They are Egyptian and Kuwaiti Mona hijabs – the names would probably referred to the places where these style of hijabs are originated. 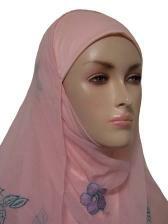 One piece hijab consists of a full underscarf with an attached scarf which is sewn to the underscarf at the top , from ear to ear, not under the chin. When the underscarf is slipped onto the head, the attached scarf falls naturally into place and only has to be wrapped once under the chin and the top of the head. The Kuwaiti Mona hijabs is one piece hijabs stylish and contemporary design with the scarf attached to the underscarf under the chin making it quicker and easier to put on. Slip the underscarf on, pull the shawl under the chin and around the neck, and pin it to the other side. The Kuwaiti Mona hijab, the most popular mona hijab, is great for teenagers as the fit of the underscarf on this hijab usually suits smaller size head. However, you can also find bigger size underscarf for adult as well. 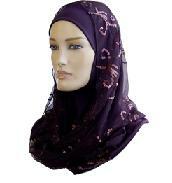 You can find size chart for Kuwaiti Mona hijab in at http://www.middleeasternmall.com. The difference between Egyptian and Kuwaiti mona hijab is further explained in this site, though it does not identify Egyptian mona hijab as another type of mona hijab, but it is called so to some people. As you enjoy and find inspiration from the ideas here, would you like to share with us and submit your own Hijab tips, ideas and photos. 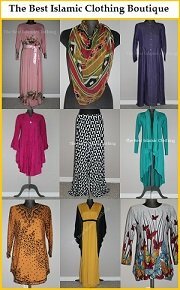 You'll be taking part in creating and developing the 'best' Islamic clothing ideas resource that's absolutely FREE for every Muslimah to share here, InsyaAllah!